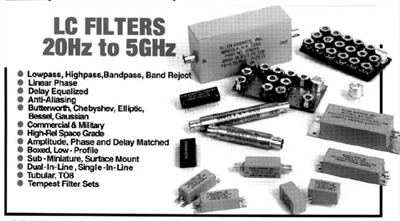 Diplexers are three-port frequency selective devices that may be used as a separator or a combiner of signals. The low-high diplexers manufactured by Allen Avionics consist of two filters sharing a common port. The common port and the output of the two filters (low and high) or (RX and TX) form the three terminals of the diplexer. Signals applied to the common port are separated in accordance with the passband frequencies of the filters.